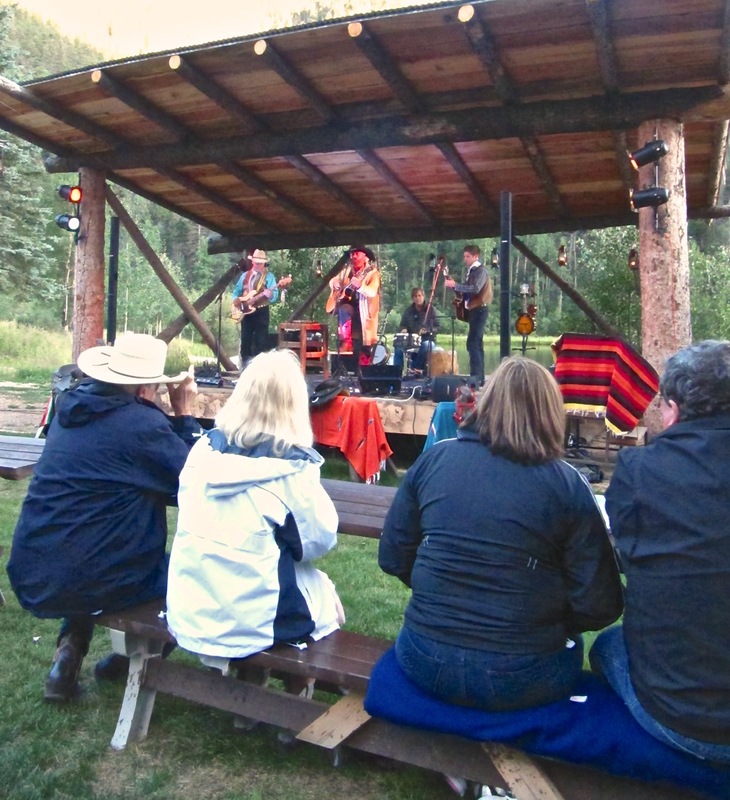 On this August Saturday evening we made our way up Bitter Creek Trail for the chuckwagon-style dinner and musical entertainment. Located north of the western resort town of Red River the 2+ miles of gravel road is rocky and steep in places but nothing the family sedan can’t handle with careful driving. 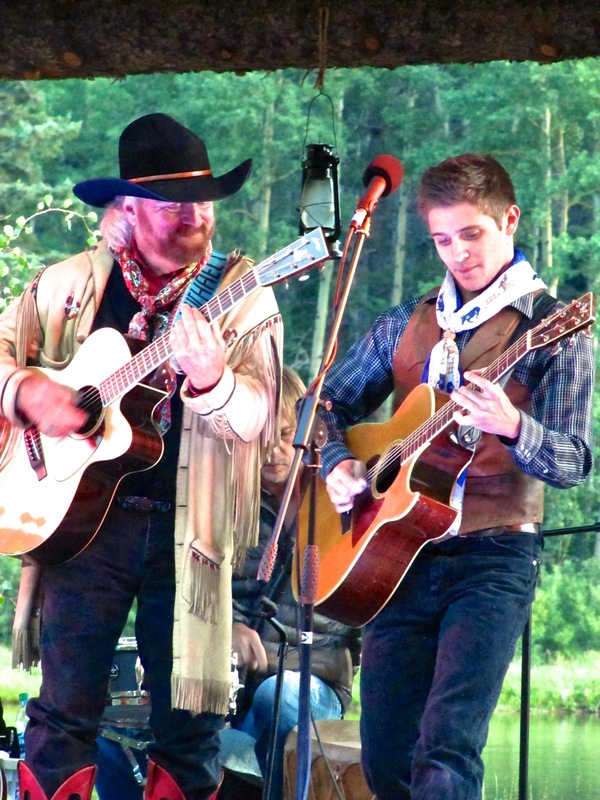 Festivities start around 6pm with a barbecue buffet prepared by Texas Reds Steakhouse in Red River. We filled plates with beef slices, smoked sausage, BBQ sauce, beans, macaroni and potato salads and wheat rolls. A special treat this evening was a big dish of stewed fresh apricots. Warm peach cobbler and vanilla ice cream completed the meal; along with hot coffee and/or soft drinks. Four tiers of tables and benches are spread out in front of the outdoor stage – good viewing from any location. A large tent is available in the case of evening rain. When the sun sinks behind the mountain the temperature changes quickly. We were thankful for the fleece and windbreakers we brought along. Many guests arrive with blankets. 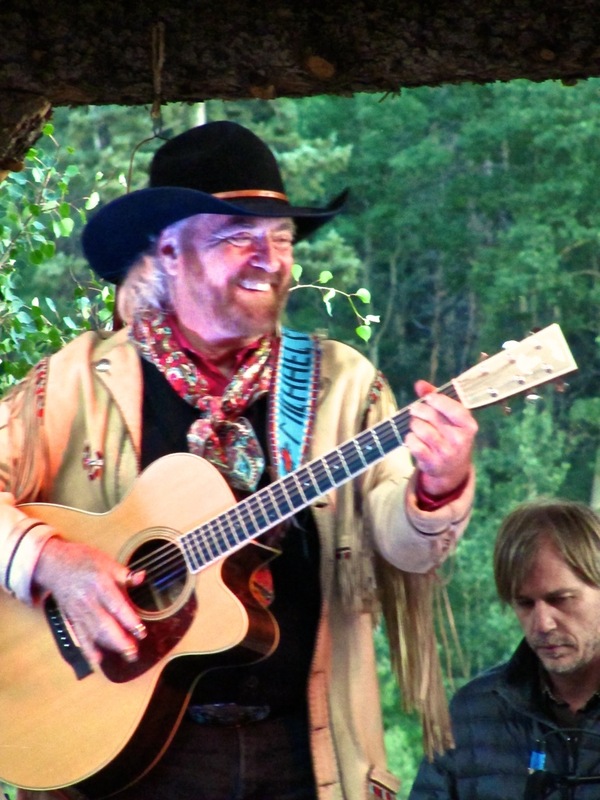 Between dinner and the music there’s time to check out MMM’s CDs including his latest release, “Red River Drifter”, and art work by band member Gary Roller. The friendly, relaxed atmosphere feels like joining Murphy and crew for a family barbecue. MMM visits with the guests and poses for pictures – from cute pre-schoolers to silly old ladies eager for a souvenir photo. 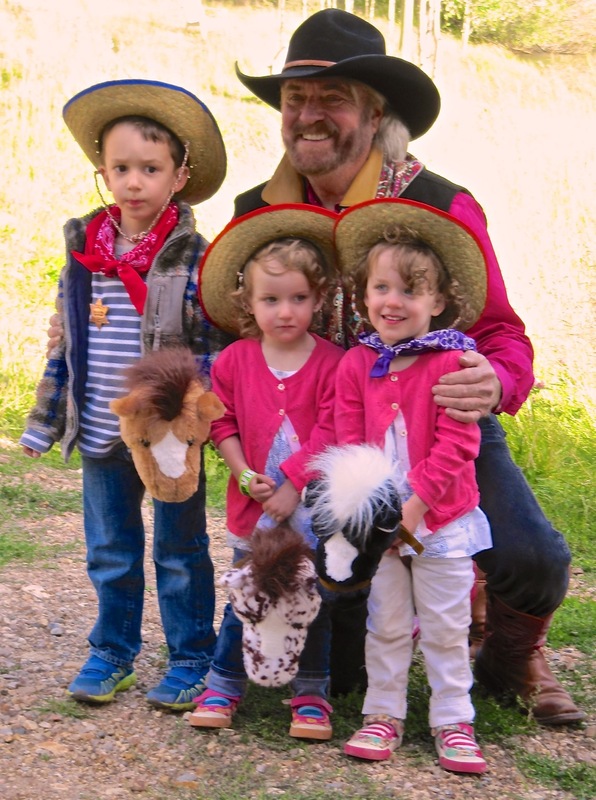 This evening one extended family included three adorable youngsters prepared for the occasion with straw cowboy hats, stick horses and plenty of giddy-up. We’ve seen MMM perform in theaters, large venues and with a symphony orchestra but never have we had as much fun as the Rocking 3M Amphitheater. It truly appeared as if he was having as much fun as his appreciative audience. A leisurely summer Sunday in Taos started with breakfast at Guitz. We first tried this locally popular cafe a couple of times last year and it was high on the list for a return visit. The menu includes creative combinations after one gets past the Basic Breakfast and French Toast (which I so recommend). Bob ordered the Scrambled Egg Tower – scrambled eggs, mushrooms, spinach, diced tomato & Manchego cheese – served with Guitz potatoes & mixed green salad.I selected the Spanish Tortlla – Spanish omelette baked with onion and potatoes, topped with warm cucumber mushrooms & tomatoes, drizzled with basil pesto, served with olive tapenade & crustini. Great way to start the day. Between time reading and drawing at the casita we explored back roads and drove out to the Rio Grande Gorge Bridge. 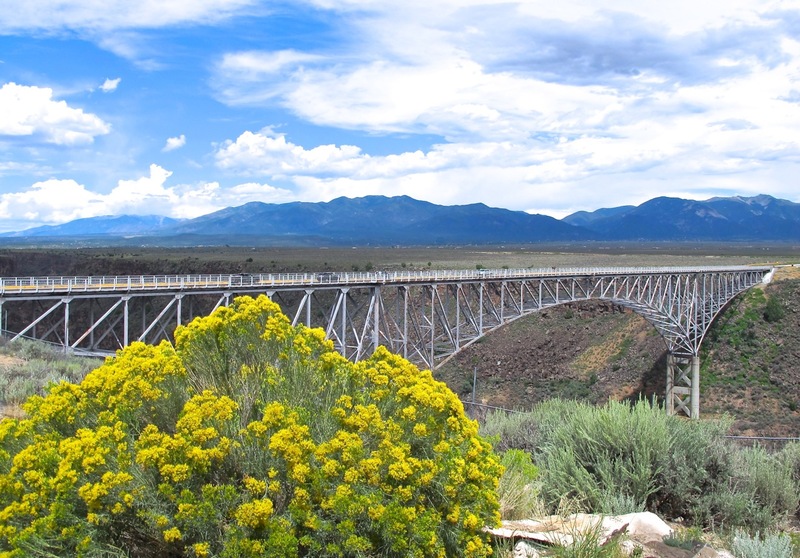 Spanning the gorge more than 500 feet above the Rio Grande River the is the 7th highest bridge in the U.S. The gorge slices the Northern New Mexico landscape for approximately 50 miles with depths up to 800′. Designated in 2013 as the Rio Grande del Norte National Monument, 74 miles of the Wild and Scenic River is a draw for whitewater rafters, anglers, hikers and artists. The evening started with an opening orientation session for Bob’s workshop with artist/potter Stephen Kilborn. Always a good time catching up with the Kilborns and seeing friends made in previous classes plus several new participants. 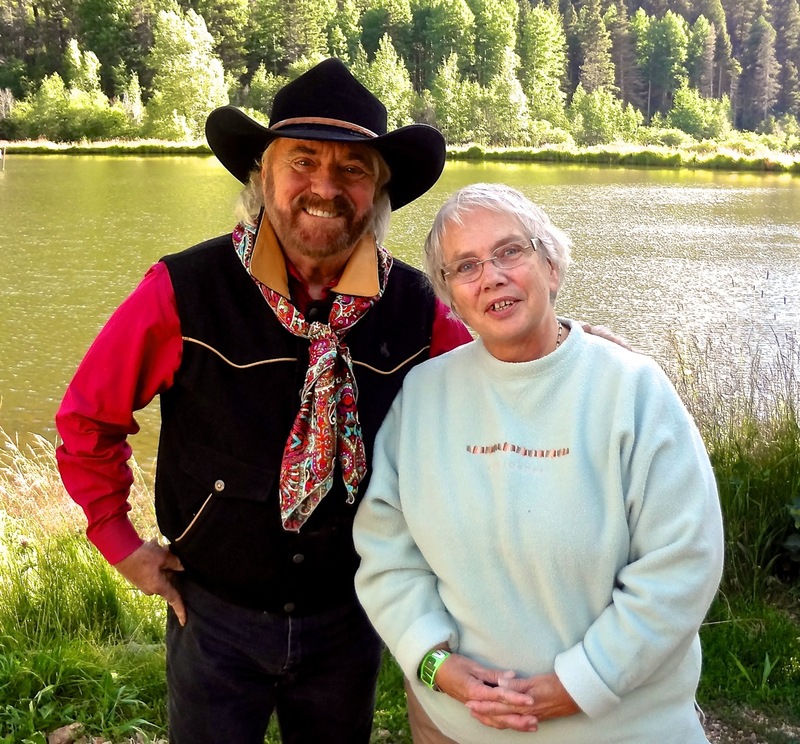 Afterwards we joined friends Dolores and Orrel for dinner at Doc Martin’s in Taos Inn. We noted that the menu selection were fewer than in previous years and missing the ladies favorite watermelon gazpacho. Our waitress provided cheerful, excellent service. 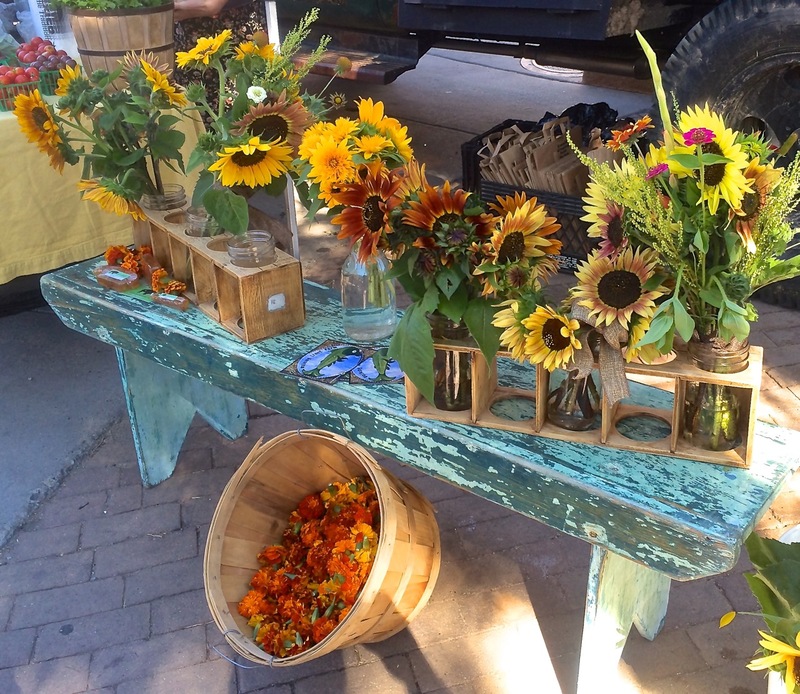 Saturday morning started with a visit to the Taos Farmers’ Market. 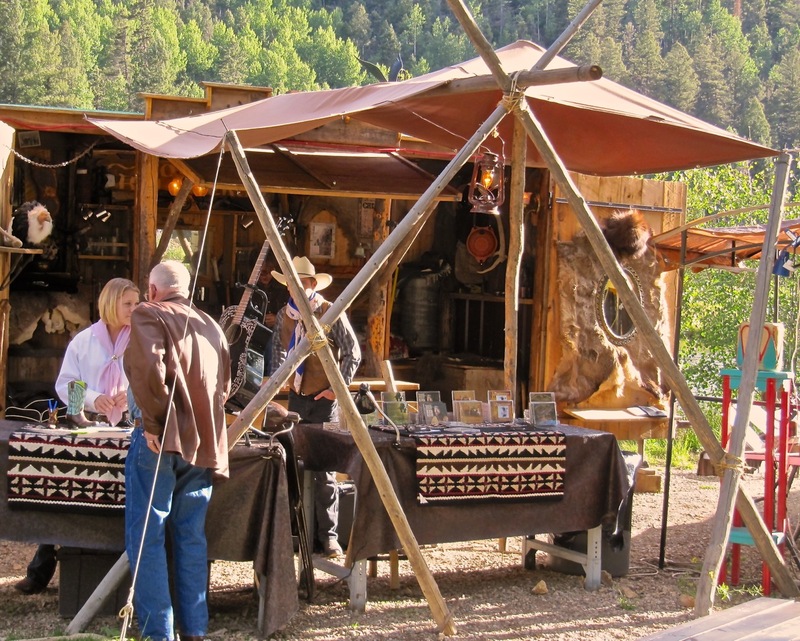 Local growers, producers and purchasers fill Taos Plaza. 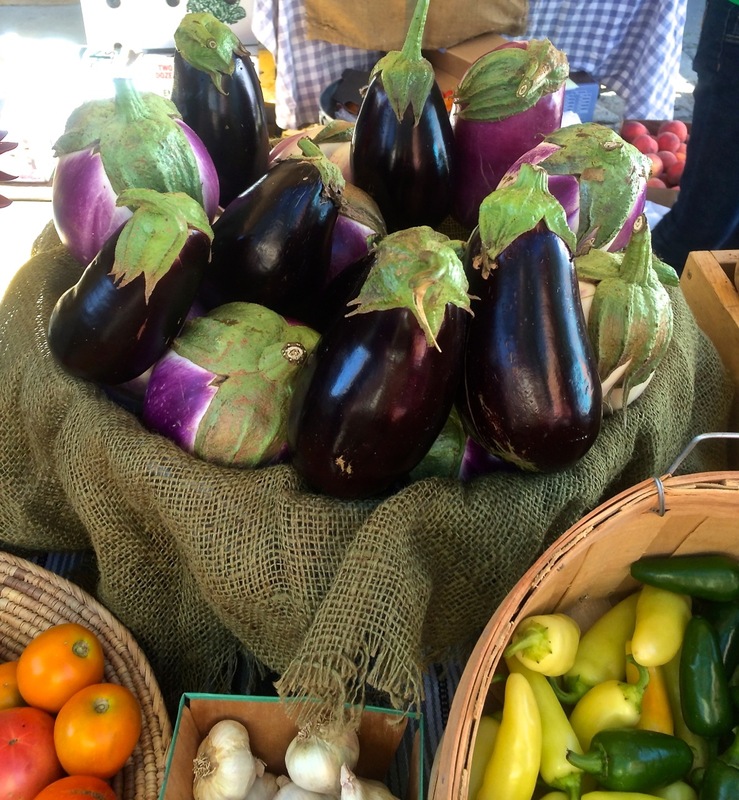 Even though I don’t plan to do much cooking this week I’m tempted by almost every vendor. Just walking through the market and admiring the artful displays provides pleasure. We left with watermelon and cantaloupe from Rocky Ford, CO, red ripe “Happy” tomatoes, a perfect bunch of radishes and a giant sticky bun for tomorrow’s breakfast. A bonus was running into one of the artist Bob’s painted with at previous workshops. 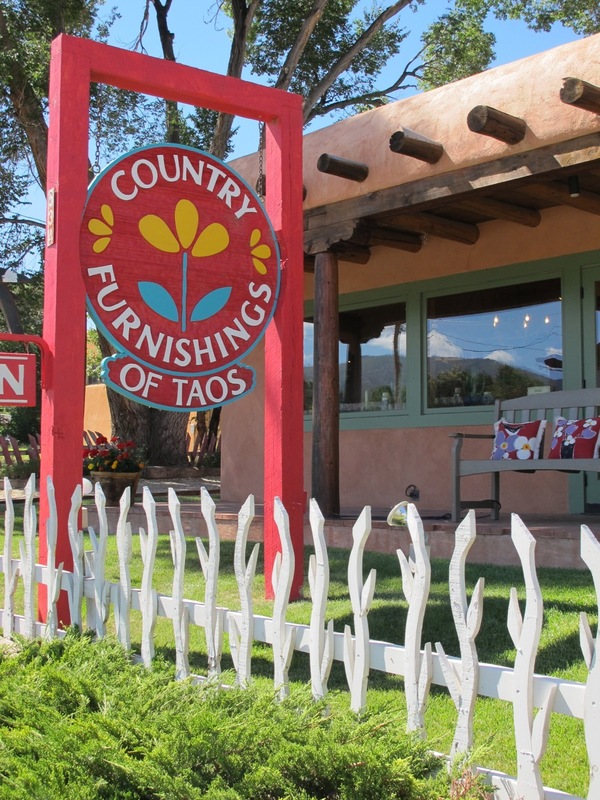 Our second stop was to Country Furnishings of Taos, north of downtown Taos. I can always find something to fall in love with at this charming shop filled to the brim with everything from hand carved chests to hand lotion, many from local craftsmen. I actually started my Christmas shopping here today. I’ll probably return a couple more times this week to add to my stash of gifts from merchandise not found in every store and reasonable prices. 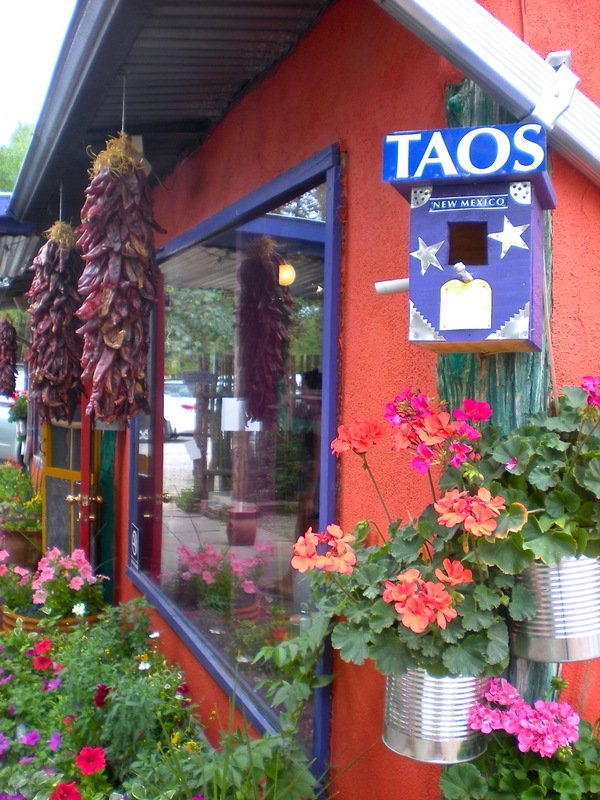 Next destination was the village 0f Arroyo Seco seven miles northeast of Taos. Our initial purpose was to place a custom order with jeweler Claire Haye. 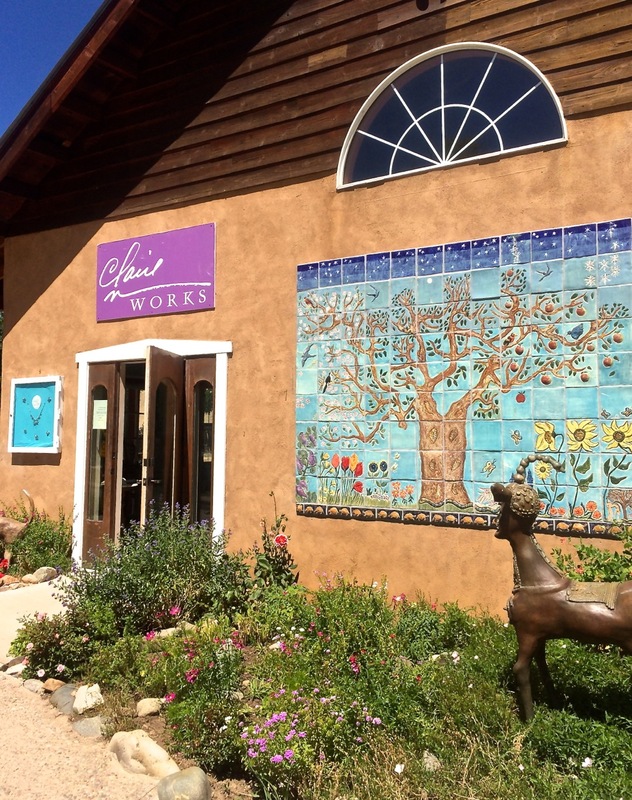 Her creative designs fill the Claire Works shop – necklaces, bracelets, pins, rings earrings. With my “assistance” Bob shops for future gift occasions. We were surprised to see friend Holly working today and grateful for the, “Try this necklace, it looks so good on,” suggestion. One more holiday Bob has covered – if I can wait that long. 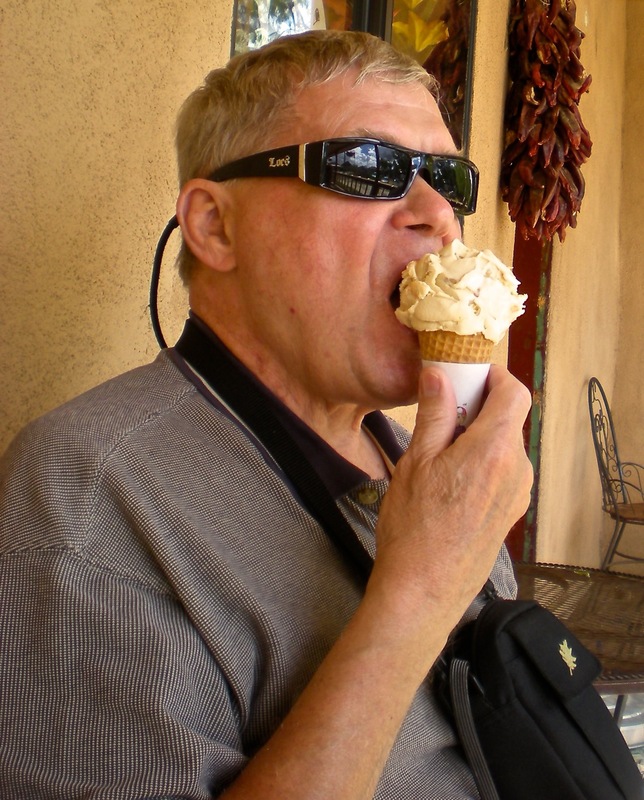 We cross the street to indulge in the best ice cream in New Mexico at Taos Cow. They didn’t have my favorite flavor today, caramel piñon nut, but the generous single dip cone of coconut did not disappoint. Mid-afternoon found us at Orlando’s Cafe for a late lunch. 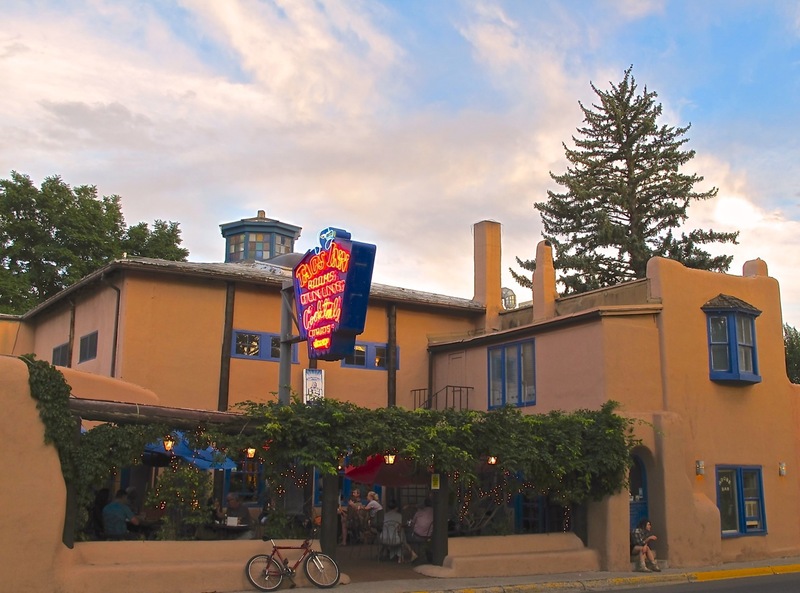 For almost 20 years this has been my favorite spot for traditional Northern New Mexico cuisine. Bob had the soft shell chicken tacos and I selected the smothered shredded beef burrito accompanied by beans and posole. I was never a posole fan until Orlando’s version. Half the large burrito came home with me for a weekday lunch. Orlando’s is another business we’ll return to this week. 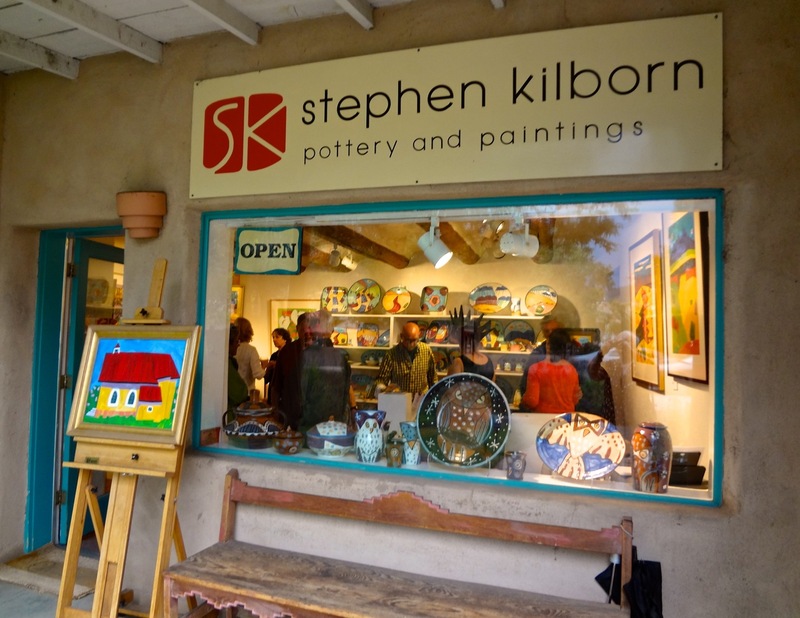 We finish the afternoon with visits to three galleries along Kit Carson Road – Angie Coleman’s Studio/Gallery, Mission Gallery and Bryans. 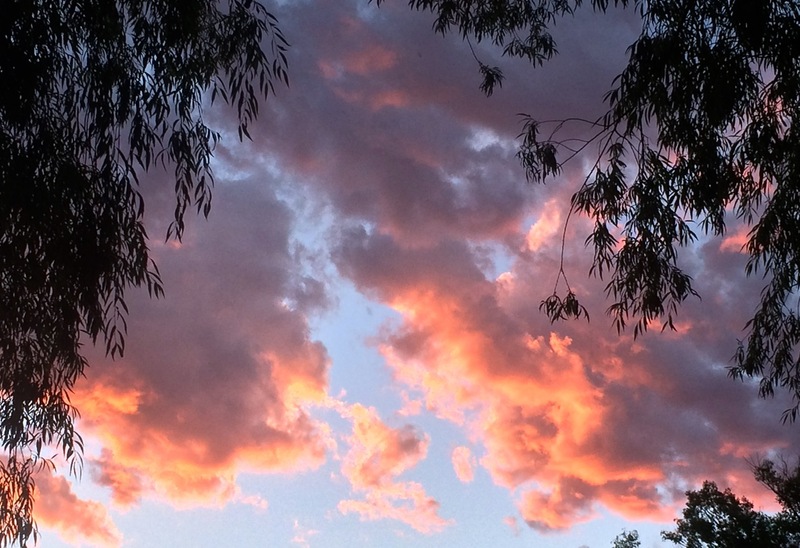 After a full day of visiting all these favorites we happily retired to the casita for a peaceful evening and a New Mexico sunset. No matter how many times we make the nearly 300-mile drive from the Denver area to Taos, New Mexico there’s always excited anticipation. In light of mid-summer paving projects on I-25 we opt to try bypasses for both Colorado Springs and Pueblo. Heading west on US50 we spot a Pass Key Restaurant – a Pueblo tradition. Their Italian sausage sandwich is a favorite indulgence for Bob. We normally stop at the restaurant on Abriendo Avenue (near the original site of Pass Key Drive-In circa 1952) so the US 50 location is new to us although they’re celebrating their 25th anniversary. 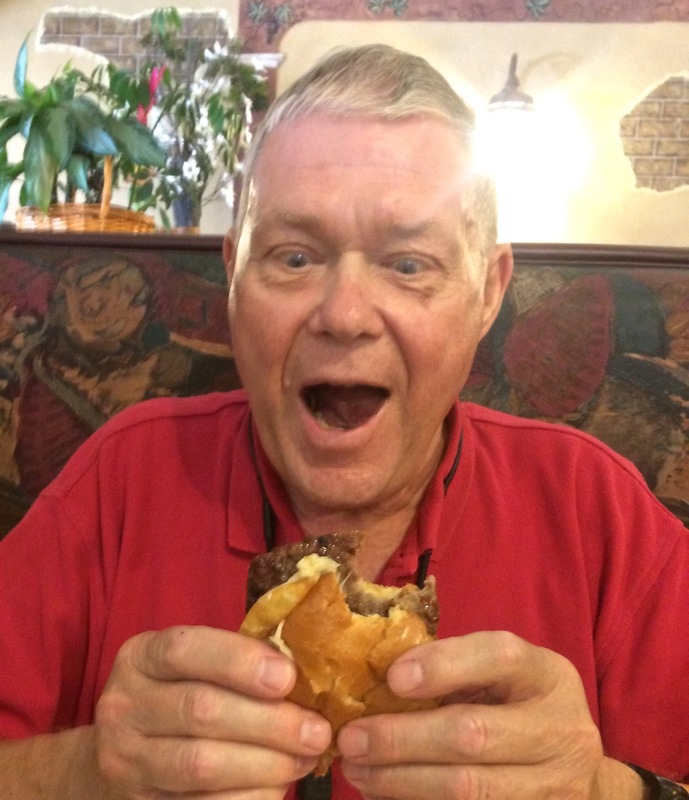 Bob had his first Pass Key sausage sandwich in 1963 and could hardly wait for today’s edition. Reaching Taos we’re delighted to get settled into the casita we’ve rented each summer for several years. 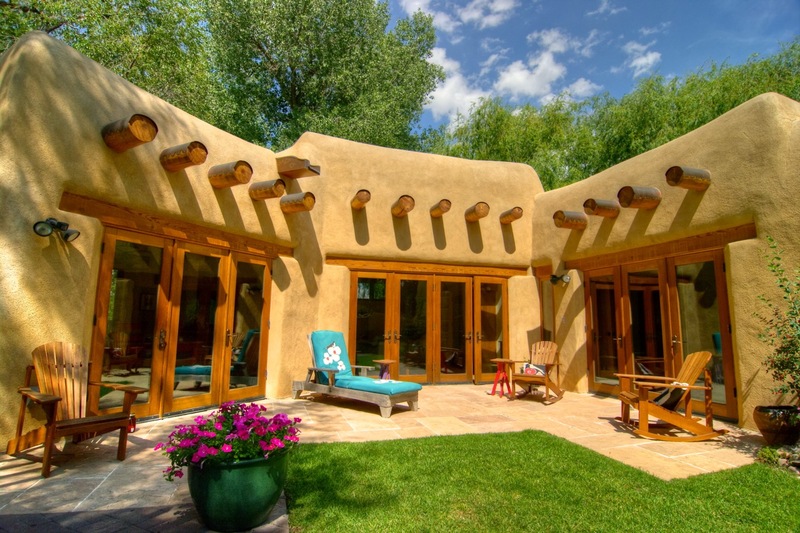 Casa de las Abuelas is a modern adobe haven on a quiet Taos Lane. The private courtyard and patio calls us for a leisurely evening. For the next ten days our Taos home away from home. How do you want your chicken – deep fried, roasted, broasted? I long for fried chicken right out of the cast-iron skillet, crispy skin, cooked to perfection just like Sunday dinner to Grandma’s decades ago. Pan fried chicken is nearly impossible to find in all of the Denver metropolitan area. A half-hour south of town there’s a cafe where we’re welcome to sit down to a family-style dinner highlighted by a platter of pan fried chicken. We arrived on a Saturday a few minutes after five to occupy the last available table. Castle Cafe, in downtown Castle Rock, opens Monday-Friday for lunch, however the chicken dinner is only available during dinner hours, 4:30pm-close Monday-Saturday, 11:30am-8pm Sunday. The dinner menu includes a full range of appetizers, soups, salads, sandwiches, entrées and desserts. By far, the chicken dinner stars in popularity. 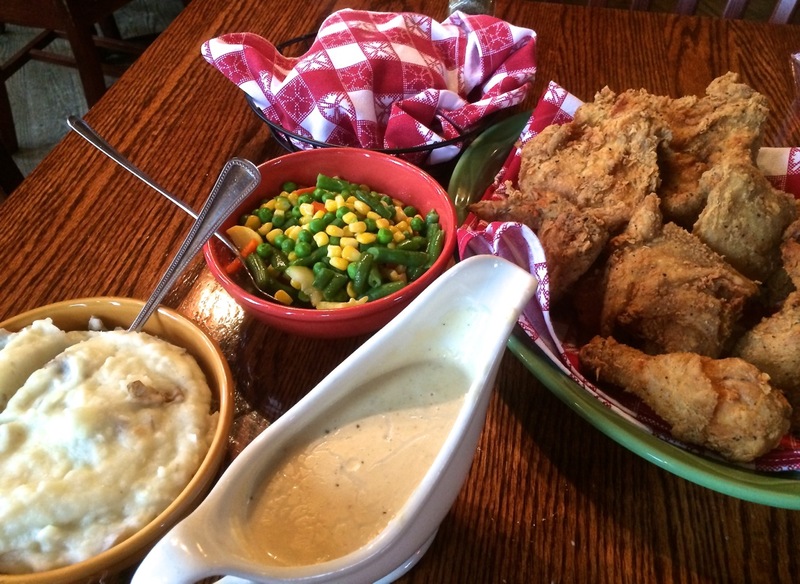 Served family style for two or more orders the meal starts with a choice of soup, salad or slaw. The menu notes “Chicken is Cooked to Order – Please Allow 30 Minutes). Having skipped lunch we ordered a queso dip and chips with our drinks. Sooner than expected a large tray of dishes was headed our way. A platter of chicken (each order includes ½ chicken), mashed potatoes, crackling gravy, veggies and homemade Parker House rolls. Even with high expectations we were not disappointed. Of course we couldn’t finish everything so a full box of leftovers accompanied us home. Desserts were tempting but we were much too well fed to indulge. We noted that many extended families gathered for the chicken dinner, reminding us again of those long ago dinners at Grandma’s. With the restaurant’s popularity unless you’re willing to wait arrive early. On this rainy evening people even waited outside under the awning and umbrellas. They won’t be disappointed. When You Go: Castle Cafe, 403 Wilcox St., Castle Rock, CO, 303-814-2233, http://castlecafe.com.